Robert "Bob" Laird Dugan, 90, of Hannibal, MO passed away at 10:19 p.m. Saturday, May 12, 2018, at his home. Funeral services will be held 11:00 a.m. Friday, May 18, 2018, at St. John's Lutheran Church in Hannibal, MO. The Rev. Eric Carlson pastor of St. John's Lutheran will officiate. Pastor Teri Maher, Robert's daughters' minister of Hannibal True Church of Hannibal will speak briefly before the service. Burial with full military honors provided by the Emmette J. Shields American Legion Post #55 will be in the Barkley Cemetery in New London, MO. Visitation will be held 10:00 a.m. until the time of the service Friday at St. John's Lutheran Church. The family is being served by the Smith Funeral Home & Chapel in Hannibal. Robert was born on December 12, 1927, in Hannibal, MO the son of Roy Lee and Nannie Mae (Sauter) Dugan. He was united in marriage to Evelyn Shepherd on March 18, 1952. She preceded him in death on January 5, 2014. Survivors include one son, The Rev. Sean Laird Dugan of Clifton Park, NY; one daughter, Stacey Johann and her special friend Mike Polster of Hannibal, MO; one grandson, Jacob Edward Johann of Hannibal, MO; one sister, Betty Fisher of Vandalia, MO; brother-in-law, Olin Duff Shepard and wife Cheri of Gravois Mills, MO and several nieces & nephews. The Rev. Sean Laird Dugan would like to thank his dear friends T. Lynn Taylor and Gayle Thompson for all their support to the family. Stacey Johann would like to give a special thanks for Mike Polster for being a caregiver and friend to Bob for the past four years. In addition to his parents and wife, Mr. Dugan was preceded in death by two brothers, Leroy and Charlie Dugan, one sister, Margaret Stark and sister-in-law, Kathyrn Stout. Robert graduated from Hannibal High School in 1948 at the age of 20 due to having Tuberculosis at a young age. 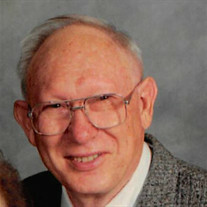 He went on to further his education at Hannibal - LaGrange College and graduated in 1951. Shortly upon graduation, Bob joined the United States Army and proudly served his country during the Korean Conflict as a communications specialist. After his honorable discharge from the Army as a Staff Sargent, Bob enrolled in the University of Missouri-Rolla where he received his degree as a Civil Engineer. Bob worked as a Civil Engineer for the Missouri Department of Transportation designing roadways. Bob had a love for flying kites. There was nothing better to him than a nice sunny day with a slight breeze and a kite in the sky. Bob also enjoyed listening music, watching MIZZZOU football, listening to the Hannibal Pirate Football games on KHBL, going to the concerts put on by the Hannibal Concert Association, or just sitting his chair watching American Pickers, Pawn Stars, PBS and political news on TV. The Dugans worked countless hours restoring their historical home back to its original beauty in their younger years when they were members of the Friends of Historical Hannibal. Bob was also a member of the Emmette J. Shields American Legion Post #55 and St. John's Lutheran Church. Pallbearers will be Jacob Johann, Mike Polster, Dave Andel, Larry Stout, Mike Shepherd, Ron Dugan, Bill Dugan and Steve Fisher. Memorial contributions may be made to St. John's Lutheran Church, in care of the Smith Funeral Home & Chapel.